Should I Coach My Youth Football Team to Win? Just now I was looking over my blog stats and came across this search phrase, ” should I coach my youth football team to win?” And, I just had to start writing this post. Oh this is a sad day. I must be old school since I am approaching 50 years old. Why teach anyone a game and not teach them how to win? Winning is an attitude and losing is a habit hard to break. As a coach you want to teach your players how to play the game and all the fundamentals but you also need to teach them how to win and why winning is important. Yes, I said it winning is important to build self confidence and character just like losing builds character and teaches one that losing is for the other guy not me. I am not going to feel this defeated again so I am going to work harder than the next guy so I can win the next time. Competitive Youth Sports like youth football teach our young men and women life lessons. Life is not easy. You must work hard to achieve success. No one is going to give you the win, you must earn it and take it from someone else. Just like the job you interviewed for and the raise you are competing for or maybe the partnership at the CPA firm or Law Firm. These are wins and losses. How to win and lose is mush easier to teach while our children are young rather than letting them learn on their first “real” job at 24 years old that they are whiney brats and get fired because an over achiever spanked them on a huge project. No you were not there to help them, so they bombed. Someone in the 1960’s decided they did not like losing as a child so they came up everyone gets a trophy and an “A”. Well that does not happen in adult life. Most of us lost that dream job we wanted to someone else and took our second or third choice. And life goes on. We are still happy, maybe not ecstatic over our jobs, but most of us are still working harder and striving to achieve the dream. It has been my experience that most young athletes like to win and prefer to keep score. Mother Nature also keeps score in survival of the fittest. Winning is on our blood and genes. Teach your football team how to win with honor and respect and most importantly how to handle defeat. And as always, play for fun but Winning is Funner! I just want to say I love your site! 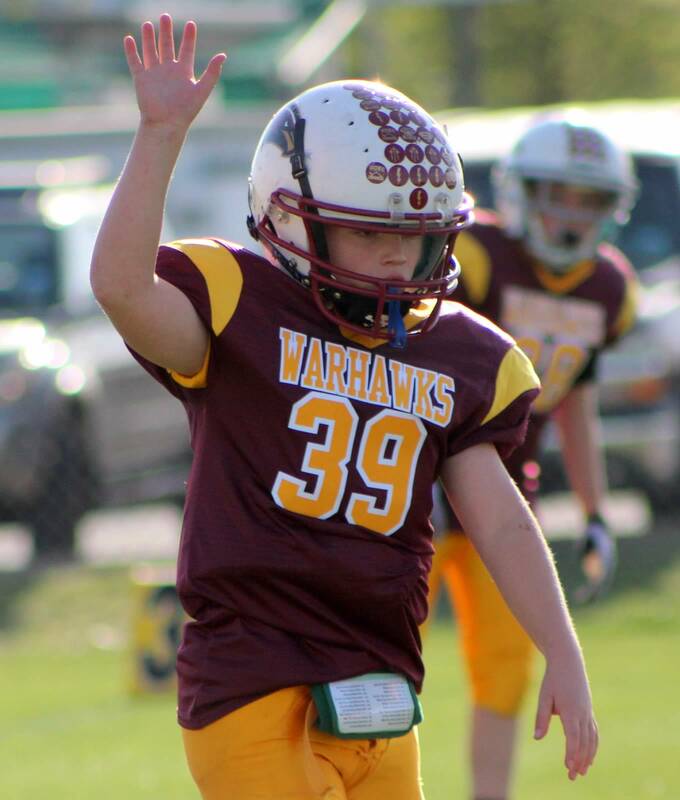 My son is 10, 5’5″ and 164.4 lbs, quick, strong, and motivated. He really wants to play in the SEC when he is older. He is a strong LG, and dominated last season at NG. Any tips on how I can continue to help him develop his skills while keeping it fun? We recently started beginning weight lifting and plyo during the off season for conditioning. Coach Parker, there is a HUGE difference between the way you should coach an 8-9 year old vs a 12-14 year old vs 24 year old adult. 8-9 year old kid’s main reasons they play football is to have fun, learn fundamentals, be part of a team and hopefully win. Winning is just part of it but not the main reason they play. If you make winning the main priority for this age group, you have got it wrong. It is YOUR priority, not theirs. At this age it is important to let all the kids play and dont focus too much on the superstars to try to win. The superstars will have plenty of time to shine as they get older and move into Jr High and out of “daddy ball”. The game is for the kids, not coaches. As kids get older, winning gradually becomes more important to them. There are plenty of years from 12-18 to mold them and teach them about winning and losing, character, how to handle different things and other appropriate life lessons. I’m all for discipline, fundamentals, respect, sportsmanship and teaching kids to win the game but you should not coach 8-9 year old kids the same way you coach 12-13 year olds or the same way you coach 15-18 year olds and the same goes for parenting. Coach and parent based on their age. There are a lot of coaches who dont have the same goals as the kids and they think if they win, that they are a good coach. That is very egotistical. Being a winning coach for 8-9 year olds does not neccessarily mean you are a good coach. Just like a Dad that has a kid who does great in school is not neccessarily a great Dad if he yells and berates his son because the Dad wants him to achieve “Dad’s goals”. Expecially if the son does not respect him or like the way he is treated. The top measurables for a coach of kids under 12 are in this order- did the kids: #1 have fun; #2 learn proper techniques; #3 get proper playing time; #4 develop good teamwork; #5 win. The win / loss record of a coach becomes more of success measurement the older the kids get because it becomes more important to the KIDS. Coaches of kids should always make sure they put their priorities and ego in check. Remember- the game is about the kids, not the coach!! Thanks for your post Mark. It has been my experience that everyone likes to win vs, losing even at 8 years old. At 8 years old I wanted to win and at close to 50 I still like to win. It is more fun to win. My saying has always been play for fun and winning is funner. My teams are well coached, they have a ton of fun, everyone gets to play, many of our players come back to our team or want to play for us again and we win. You should coach your team how to win and why that is important. It is never to early to learn to win. It has been my experience if you just teach fundamentals and have fun and not focus on winning, your team will lose and then parents are mad and you lose players, Just a fact. Thanks again for your response.